The Alien Skin Exposure X4.5 update has brought support for LUTs and new Haze and Lens Flare updates, adding to its already impressive list of features. Exposure X4.5 is a powerful, effective and engaging all-in-one photo browsing, organising and editing tool that can product hauntingly beautiful analog-inspired images. It can help recapture the emotion in photography that’s so easily lost in a world of histograms, megapixels and lab charts. Exposure X4.5 offers a similar set of tools and features to many rival programs, but its approach is somehow subtler, more creative, calmer and ultimately very powerful. It doesn’t do dramatic ‘in-your-face’ effects or wild photo manipulations. Instead, its library of preset effects is rooted in atmospheric and evocative ‘film’ looks, with quiet depth and intensity. 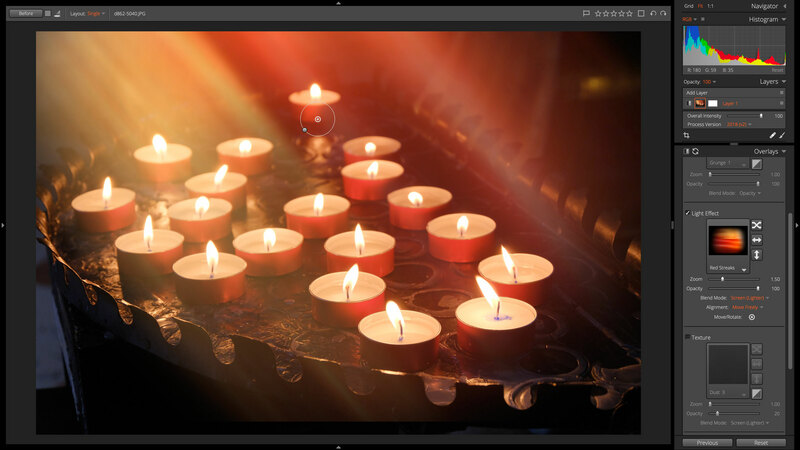 It started out as a Photoshop and Lightroom plug-in and can still be used in that mode, and as an external editor for Capture One, for example, but Exposure X has evolved so that it can also be used as a standalone program with its own integrated photo browsing and cataloguing tools. 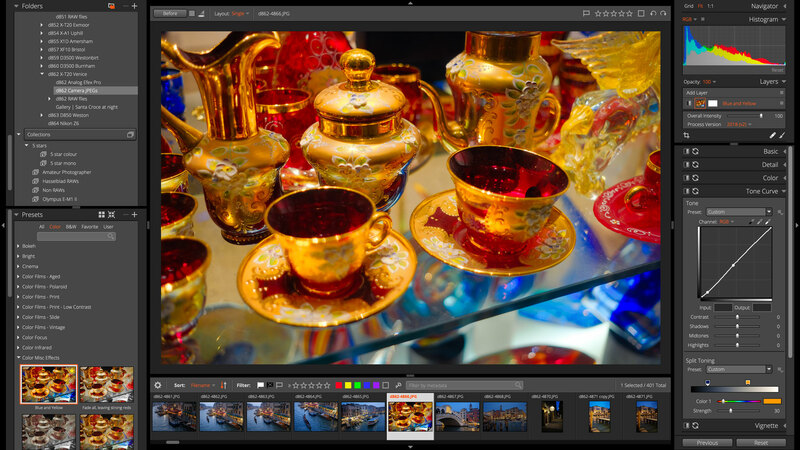 Like Lightroom, Exposure X4.5 is a fully non-destructive photo editor. All the adjustments you make to your photos are ‘virtual’ and fully reversible. You can create new, ‘processed’ versions of your photos at will, while leaving the originals unaltered and intact. What’s different, though, is that its effects and overlays go far beyond anything you can achieve in Lightroom. The editing tools aren’t all about film effects. They include regular photo enhancement and retouching options too, such as curves, cloning and perspective corrections. Exposure X4.5 can’t combine different images, both otherwise it’s close to being the complete all-in-one photo editing program. One of the big complaints about Lightroom is that it makes you import your photos into its Library before you can work on them and doesn’t automatically update if you make changes outside of it, such as adding more images, renaming files or moving photos around. Exposure X4 works in a very different, rather clever way. You still have to choose the folders you want it to organise by adding them as ‘bookmarks’, so you can’t just take a look at the contents of any random folder – you do need some kind of filing system. The difference is, though, that Exposure X4 will react ‘live’ to any changes within these folders, even if they’re made outside the program. For many users this will be a much smarter system, and it’s one also used by ON1 Photo RAW 2019 and Skylum Luminar 3. The only danger is that if you use other software to move files, they might get separated from the adjustment data created by Exposure X4.5, which is stored in a subfolder alongside your images. If you have made adjustments, it is best to use Exposure X4.5 to move any files subsequently. Once a folder is ‘bookmarked’, you can browse its folders and subfolders at will. But they’re also indexed and catalogued, so you can search for photos using keywords or other image metadata right across your photo library. You can also create Collections to bring related images together ‘virtually’ rather than changing their folder location. A single image can only be in one folder, but it can be in as many Collections as you like. Better still, in Exposure X4, Alien Skin added Smart Collections. With these, instead of adding photos manually, you simply specific a set of conditions – a particular camera or lens, for example, or a particular keyword – and Exposure X4.5 will populate the Smart Collection automatically with matching images. Exposure X4’s new Smart Collections are like saved searches that automatically populate with images that match the criteria you set. 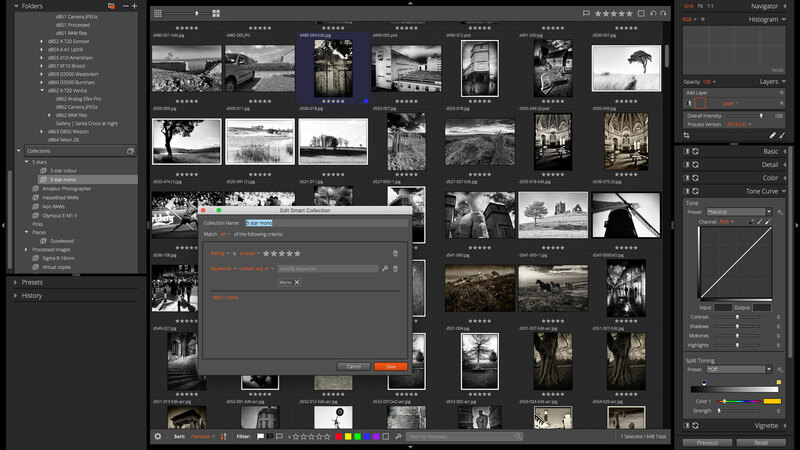 Exposure X4.5 is not the fastest search tool out there – it can sometimes take a few seconds to scan a folder or find matching photos for a Smart Collection. Otherwise, Exposure X4.5 is very good at organising your photos. It’s easy to understand how it works, it’s pretty quickly for the most part, it’s flexible, and once you’ve specified a top folder for your photo collection, any sub-folders you add will be catalogued automatically. Exposure X4.5 is a non-destructive photo editor. That means all its changes are stored as processing instructions in separate ‘metadata’ files stored in the same folder. They’re not applied permanently to the photo unless you export it as a new, processed file – the original photo remains unaltered. Exposure X4 is like Lightroom CC and Lightroom Classic, Capture One Pro and ON1 Photo RAW in this respect. It’s a great system because you can go back and change the settings at any time, and you can create ‘virtual’ copies with different settings, without creating duplicate photos on your hard disk. Exposure X4.5 can edit any kind of image file, including JPEGs, TIFFs and RAW files. (It supports the vast majority of camera RAW formats, but you may have to wait a few weeks for support to be added for very new camera models). You can use Exposure X4 as a regular photo editing tool for curves, retouching, local adjustments with masks and, in this version, perspective corrections. In this version, Alien Skin has added improved highlight and shadow recovering tools for RAW files, which makes it easier to extract the maximum tonal information from your files. It’s still not quite the best RAW converter out there, however, particularly for sharpness and noise control, and DxO PhotoLab and Capture One Pro still lead the field here – Adobe Camera Raw and Lightroom are good for wide camera/lens support and local adjustments, too. This is why it’s useful to be able to use Exposure X4.5 as a plug-in – in case you’d rather use another tool for your RAW processing. Nevertheless, Exposure X4.5 does do a decent job with most camera RAW formats and delivers more colour and tonal data than you’d get from JPEGs. It also applies automatic lens correction profiles, though it’s annoying there’s no separate chromatic aberration removal tool, since this can still sometimes creep through in RAW files. Exposure X4.5 does not offer support for combining image layers, so you can’t add a new sky to a landscape, for example. But it does offer adjustment layers and masks for combining adjustments and effects. If what you need is a tool for enhancing single images rather than creating composites, it has all the power you’re likely to need. You can create as many adjustment layers as you like, and apply the full range of editing tools and image effects to any of them. You can create layer masks manually using a brush tool, or with a gradient or radial mask tool. Its strong point is its array of traditional ‘analog’ film and darkroom effects, but Exposure X4 is also a very competent everyday photo editor, offering curves/levels adjustments, sharpness and noise reduction, cropping, retouching, colour adjustments and – new in version 4 – comprehensive perspective correction tools for fixing skewed images, converging verticals in shots of tall buildings and more. It’s a great all-round photo organising and editing tool, but most users will choose Exposure X4.5 for its library of analog effects presets. These are organised into Colour and Black and White categories and into sub-categories within these, such as ‘Cinema’ effects or ‘B&W film’ looks. Each of these presets is made using settings applied in the tools panel on the right, so it’s easy to see how they’ve been achieved, modify them and create your own. You can build your own effects manually from scratch, but the presets give you a useful head start and also give you ideas for ways to process your pictures that you might not have thought of otherwise. The key to many of Exposure X4.5’s signature ‘looks’ is its Overlays panel. This has three sections for Borders, Light Effects and Textures. You can use a Border overlay to add an authentic-looking negative frame or print border, and use Textures to apply dust, scratches or a mottled ‘distressed’ look. The Light Effects tools have been updated in this version. Originally designed to simulate the ‘light leaks’ of cheap or vintage cameras, these are now highly adjustable – you can move the effect around, change its zoom setting or opacity and even rotate the effect. From being simply a tool to make pictures look as if they were taken on an old camera, the Light Effects can now be used to add simulated window flare or a hazy low sun effect to any kind of picture to add atmosphere. Version 4.5 adds new Lens Flare and Haze overlays for adding atmosphere to your images. Exposure X4.5’s real strength is its library of 500+ preset effects, which can be subtle, dramatic, unexpected or all three! Exposure X4.5 has other tools for creating these film-like effects. It can simulate many different types of film grain, for example, with an amazing degree of control – although it does sometimes look as if the grain is sitting ‘on top’ of the image detail rather than eroding it in the way you might expect. The big new addition in Exposure X4.5, though, is the new LUTs panel. LUT stands for Look-Up Table and it’s a way of applying an instant tone and colour shift to an image. 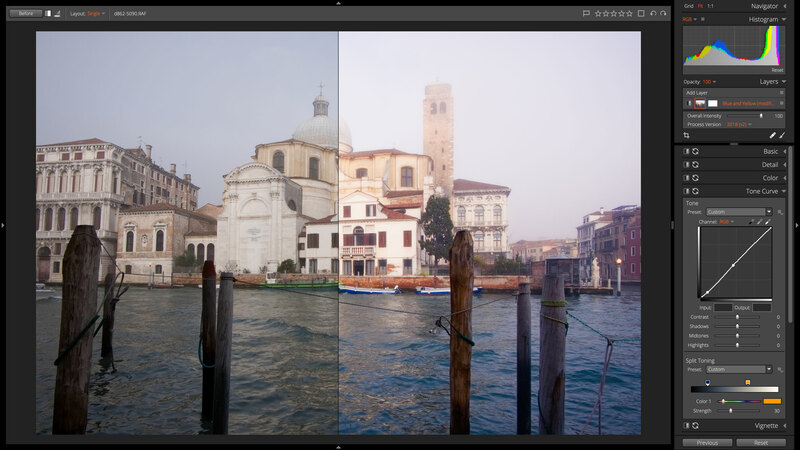 Exposure X4.5 comes with a selection of LUTs and you can easily import more – I tried it with LUTS from Lutify.me. Read this Lutify Q&A to find out more about LUTs. Alien Skin has implemented LUTs support perfectly, right from the start. You can organise them into categories and preview them ‘live’ in the LUTs panel before you choose which on to apply to your image. Exposure X4.5’s regular adjustment tools work as normal alongside these LUTs. With Exposure X4.5’s other tools you can apply vignette effects with an unexpected depth of control and very sophisticated Bokeh effects using round or ‘planar’ zones of sharp focus to simulate a very tight focal point, shallow depth of field and tilt-shift lens effects. There’s even a panel dedicated to infra-red (IR) glow and halation effects to add an ethereal glow to black and white shots or a soft-focus effect to colour portraits. The rest of Exposure X4.5’s film ‘looks’ are applied using sometimes ingenious combinations of colour and tonal control applied in a subtle and intelligent way. Individually, its adjustments can appear small and relatively insignificant, but cumulatively they can produce colour and tonal shifts of great subtlety. Lots of programs have the same or similar tools as these, but Exposure X4.5’s designers seem to have harnessed them in a particularly harmonious and effective way. What’s new and is it worth upgrading? So is it worth paying $99 to upgrade from the previous version (Exposure X3 or earlier). That’s a fairly hefty sum, so let’s do a recap. First, Exposure X4 brought improved shadow and highlight recovery. That’s certainly worth having, though Exposure X4.5 still isn’t the best for RAW file conversions so it’s a small improvement rather than a must-have upgrade. Then there’s the adjustable light effects that Exposure X4 brought in, which can certainly add atmosphere in a very controllable way to a wide variety of pictures. It might not sound like a ground-breaking step forward, but it’s worth having, for sure. You’re not likely to use the adjustable lighting effects in every shot you take, but they can add a certain analog atmosphere in the right conditions. It’s Exposure X4’s transform tools that stand to make the biggest difference. These are practically a must for fans of travel photography, architecture or interiors, as skewed verticals can spoil an otherwise great shot, and the difference between a beautifully captured interior and a snapshot is often down to the perspective control. Exposure X4’s new Smart Collections are another major bonus. You can use these to organise and find matching images in ways that would be slow and painstaking with regular Collections and Folders. 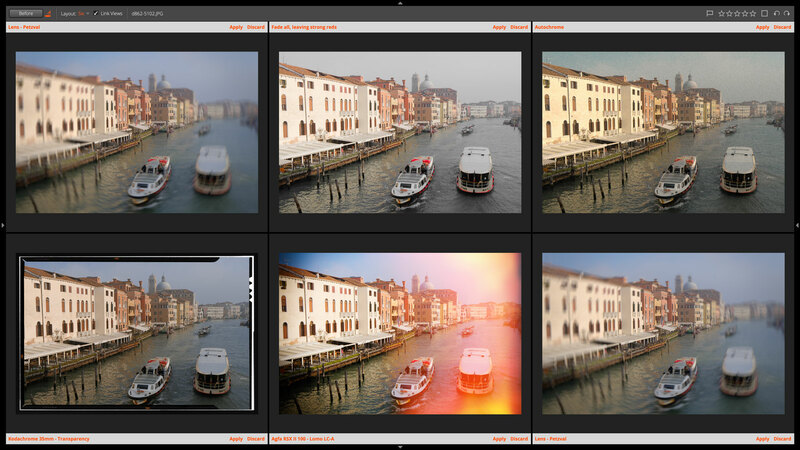 Want to find all the shots you took in Venice with your XF 23mm f/2.0 lens? With a Smart Collection it’s easy. The new tethered shooting tools work via ‘watched’ folders. At first, it looks like this is barely a feature at all, but as you dig deeper you uncover something rather interesting, not to mention powerful. The bad news is that you will still need tethering software and a cable for your camera – so what have you gained? Quite a lot, as it happens, because apart from automatically updating a nominated ‘watched’ folder as you shoot, Exposure X4 will can not only show each image as it’s captured, it can apply any metadata and keywords you choose and even automatically create virtual copies with different presets so that you can choose the ‘look’ you like later. The less obvious reason for upgrading is that you get to stay up to date with the newest camera RAW formats. There’s no guarantee that every new camera will be supported, but you can check the current list of supported RAW formats on the Alien Skin website. That long list of enhancements in Exposure X4 does feel like it justifies the upgrade price. One of the points to be made about this software is that it’s never been pitched as a cut-price bargain or a cheap alternative to a more expensive product. You buy it because you admire what it can do, not because you’re trying to get the most bang for your buck. And with Exposure X4.5 (a free update for existing Exposure X4 owners), you get the excellent new LUTs support and some more lighting effects thrown in. Not sure what preset effect would suit your image best? You can ‘audition’ up to six at a time to see them side by side. As a photo organising tool, Exposure X4.5 is straightforward, efficient and surprisingly powerful. It doesn’t offer multi-layer composites, panoramas, focus-stacking or 360 editing, but as an everyday photo enhancement, editing and retouching tool it’s rather good. Its strength, though, is its huge and evocative range of film-like effects and adjustment tools, and the subtlety with which you can combine them. It’s a shame its RAW conversions don’t have slightly better noise control, manual chromatic aberration correction and better simulation of in-camera picture styles (though it does simulate Fujifilm film simulation modes), but this is only a small part of what this software is designed to do. Where Exposure X4.5 succeeds brilliantly is the way it can apply subtle, evocative, unexpected, dramatic and authentic-looking analog appeal to everyday digital images. If you’re the sort of person who checks off a long list of required features against purchase cost and doesn’t really look any further than that, then Alien Skin Exposure X4.5 is unlikely to appeal. You can get the same tools and more for a good deal less money than this. But if you’re attempting to capture atmosphere and an elusive analog ‘feel’, and you’re prepared to judge results by how they look rather than what they cost, then it’s worth every cent (or penny, here in the UK). Alien Skin Exposure X4.5 costs $149 (upgrade $99) from the Alien Skin website, or you can download a 30-day free trial to help you make your mind up. You can find out more here. 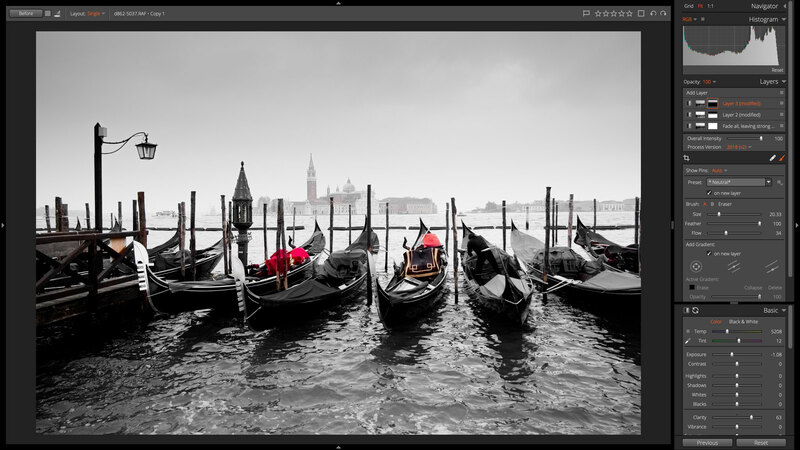 Next Next post: Lightroom alternatives: which is best?